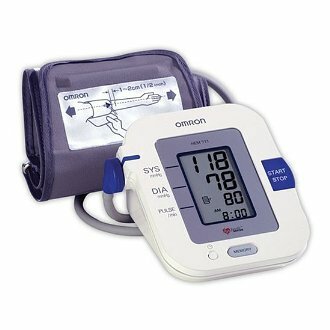 Best blood pressure monitors reviewed in this article are reviewed independently without any interest whatsoever of the manufacturer or otherwise. These blood pressure monitors have earned best monitor status according to various consumer feedback research and own assessment. This best performance status is based on factors such as price, technology used, functionality, accuracy and ease of use and aggregated reviews of hundreds upon hundreds of buyers and users world wide over a lengthy period of time. Blood pressure monitors found here are for home and personal use in general even though some may be found at the doctor's office. This monitor is designed for women. It can however also be used by men. It is nevertheless essentially designed with women in mind. One of the most outstanding aspects of the Omron Elite 7300W is its slim shape and great portability. In fact it presents an ultra-thin profile with quick and easy one-touch operation. The monitor has the IntelliSense technology which works effectively with the cuff. The technology helps provide the user with an accurate reading. comes with an Advanced Average feature. The technology can calculate on your behalf the average of the last three readings within the last ten minutes. The monitor also impresses many users due to the accompanying cuff namely the 13inch cuff which is standard size and the 13017inch cuff representing the large cuff. The large cuff becomes very comfortable for women with large arms. Blood pressure cuffs play an important role in taking blood pressure measurements which are accurate. The Elite 7300W can store a history of up to 84 readings which helps allows the user to do an analysis of their readings over a period of time. Highly useful to users is a feature called hypertension indicator found on the monitor. It lets you know should your blood pressure exceed the American Heart Association (AHA) guidelines for ideal blood pressure. The Elite 7300W also has the irregular heartbeat feature. It is amongst best blood pressure monitors because it also meets requirements of the protocols set by the AAMAI and the British Hypertension Society (BHS). Weighing only 2 pounds (about 90 grams) it has slim dimensions of 8.7x5.5x4.8 Inches. Thumps down from some customers for a somewhat too loud a beep. 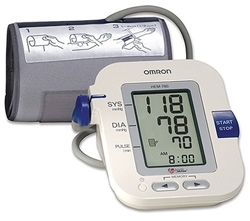 Cleared by the FDA for morning hypertension detection, the Omron HEM-790IT is a top of the range blood pressure monitor. Apart from morning hypertension detection, this blood pressure monitor which easily fits into a unique class of best blood pressure monitors also predicts heightened risk of stroke and also detects irregular heartbeat. has the patented IntelliSense technology. The only difference is that this particular monitor is for both mean and women. Is is absolutely "gender insensitive". The major highlight of the HEM-790IT is the ComFit Cuff. Cuffs matter when considering monitors. The ComFit cuff is pre-formed for a quick and comfortable fit suitable for both medium and large-seized arms which are 9-17 inches. The Omron HEM-790IT gives clinically proven readings which is absolutely important for any monitor worth its salt. It also has a 90 memory recall perfect for ongoing tracking of your blood pressure and pulse readings. The accompanying Omron Health Management Software is a favorite for doctors. This is partly the reason this monitor has been voted amongst the best blood pressure monitors by some doctors and medical professionals. This software works with a PC providing a blood pressure and pulse graph and other data making for excellent analysis. The HEM-790IT software offer morning and evening comparison graphics presenting a clear trend of your blood pressure numbers. is arguably the best selling blood pressure monitor in the U.S. particularly due to its ease of use. The monitor has a large digital display panel. 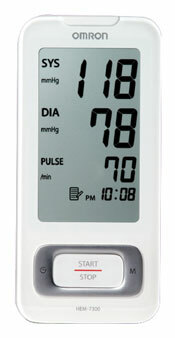 The blood pressure monitor stores measurements including pulse readings i.e heart rate.